These days we want it all. An amazing career that we actually enjoy. Tons of cash and plenty of time to do or buy whatever we want. A loving partner, well-adjusted kids, great friends, great health, a wonderful house, the list goes on and on. When our lives get too far out of balance, we find ourselves losing our passion for life, hurting those we care about, getting exhausted, burnt out, doing nothing because there are too many options, or trying to change too many things at once which means we end up accomplishing nothing. With so many things demanding our attention these days, it is no wonder we have trouble. We find ourselves wondering if a balanced life is even achievable at all, or if it is all a cruel joke. A balanced life IS achievable, but it takes understanding what your true priorities are so that you can focus on them and stop doing things that aren't helping you get where you want to be. 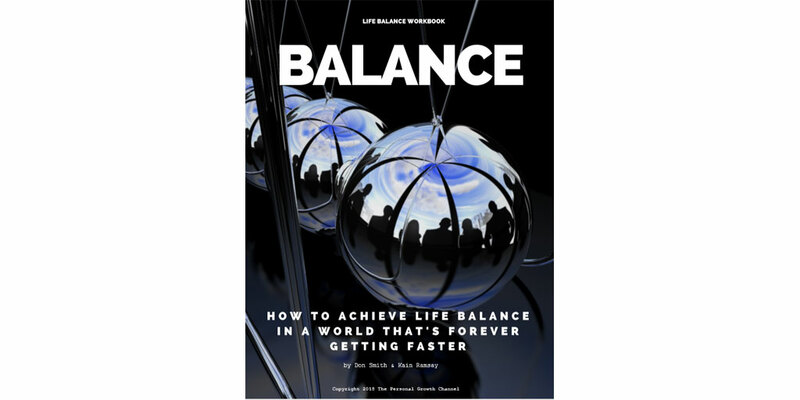 Our new workbook, "Balance: How to Achieve Life Balance in a World That's Forever Getting Faster" steps you through analyzing seven areas of your life to identify what you need to focus on so that you can break out of this cycle and bring your life back into balance. Click here to find out more. About the Authors: Kain Ramsay is a life coach who has created many courses including a life coaching certification program. Don Smith is the founder of The Personal Growth Channel and is a life coach with specialties in career, business, personal finance, and weight loss coaching.